(Al Hartmann | Tribune file photo) Utah Gov. 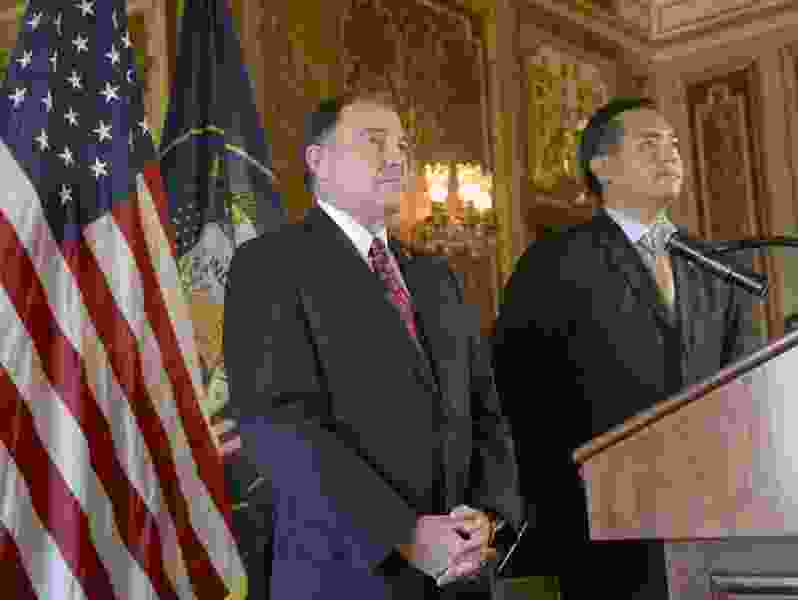 Gary Herbert, left, and Attorney General Sean Reyes speak at press conference at the state Capitol, Oct. 6, 2014. Utah legislative leaders followed through on their promises throughout the lawmaking session that ended earlier this month that they would move to bolster the power of the Legislature in relation to the other branches of government — particularly the executive. On Tuesday, Gov. Gary Herbert followed through on his threat to veto such balance-tipping bills and struck down two of them aimed at giving lawmakers more say and muscle in defending the laws they make. The governor vetoed HB198, which sought to force the state attorney general to give the Legislature a written legal opinion when requested — as already required by state law. He also vetoed SB171, which attempted to authorize lawmakers to mount their own defense of state laws when challenged in court — a duty now exclusively carried out by the attorney general. It’s unclear, though, whether the Legislature will move to override the vetoes with two-thirds of the votes in the House and Senate. While legislators have suggested that they would use the power to intervene in court sparingly, Herbert noted that SB171’s language is so broad that it could be used to act in “thousands of cases.” And he pointed out that the Legislature appropriated $700,000 to fund such efforts — enough to pay for three attorneys, a paralegal and a legal secretary. It’s unclear whether SB171 was a response to any particular court case or whether it simply was an effort to give the part-time Legislature greater powers in relation to the full-time executive, as House Speaker Greg Hughes had called for in his remarks opening the session. HB198, meanwhile, was clearly a reaction to Attorney General Sean Reyes’ refusal last year to hand over a legal opinion he had prepared at the request of lawmakers regarding the governor’s calling of a special congressional election to fill the U.S. House seat vacated by former Rep. Jason Chaffetz. That refusal infuriated lawmakers, who pointed out that state law requires the attorney general to write and deliver legal opinions to the Legislature upon request. HB198 sought to strengthen that requirement by allowing the Legislature to ask the state Supreme Court to force the attorney general to comply and to require the attorney general to avert a potential conflict in the first place, through confidentiality and screening safeguards. SB171 and HB198 both passed the House and Senate with two-thirds majorities that, if supporters stood firm, would be enough to override the vetoes. Sen. Stuart Adams, R-Layton, and Rep. Merrill Nelson, R-Grantsville — who sponsored SB171 and HB198, respectively — said they needed more time before deciding whether to try for a veto override, although they acknowledged the possibility. Adams said his bill would allow the Legislature to intervene in lawsuits, which the branch already does frequently. House Majority Leader Brad Wilson, R-Kaysville, predicted Tuesday night that the Legislature will try to override Herbert’s vetoes of the bills designed to give legislators more power. “Whenever you have a legislative body elected by the citizens of Utah that overwhelmingly passes two bills with significant long-term consequences for how the state operates, a veto override session is appropriate,” Wilson texted. Each chamber’s leader stood by the measures and said lawmakers would discuss the idea to override the veto. Hughes said that because of the overwhelming bipartisan support the measures earned, "I would hope that both bills would be candidates for an override." He also said no one takes offense when the governor vetoes a bill or two, but legislators can sometimes be wary of overriding the governor, so he was unwilling to make a prediction — though he wouldn't second-guess them. Reporters Paighten Harkins and Lee Davidson contributed to this story.